I had heard there were places in Paris you could still find one of these. I thought perhaps it was a myth -- like spotting a Unicorn, or Elvis -- but apparently it's true. Because I finally spotted one. 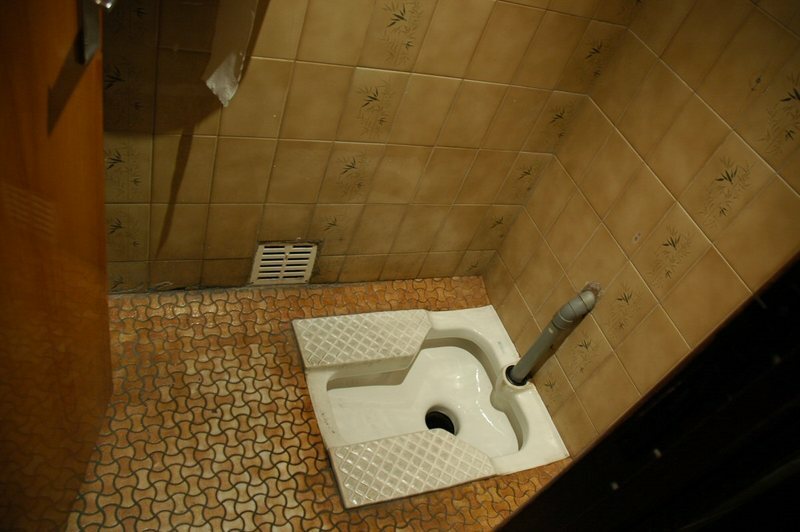 If you don't know what this is, it's commonly known as a "Turkish toilet". I'd heard of them but never seen one up close and personal. I'm pretty sure I could figure out how it's supposed to work, and this one apparently came with a flushing mechanism. Fortunately for ME... this was in the MEN'S cabine. I noticed it through the open door. And just happened to have my camera on me to capture the moment. The women's cabine had the more conventional apparatus. I might not be so lucky another time. Because if there's ONE out there, then there are sure to be others. But seriously, France is supposed to be a modern country, Paris is now a modern city (we've got Ikea and everything), and it's Two Thousand Flipping Seven already. Would it cost that much to install modern plumbing? Some of these restaurants are so cheap!